Transform the area below your deck for the ultimate outdoor experience this summer. You can take advantage of this unused space and make it the perfect place to relax during the summer. Your custom-made Under Deck System by RainAway can be an extension to your pool area, dining room and even living room with some additional amenities and furniture. There are many ways to increase the comfort level of your new favorite getaway! By simply installing a few accessories, your under deck will be an oasis for relaxation. 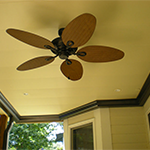 Ceiling fans, mosquito torches, string lights and even a mini bar can be added to your under deck to help you unwind. Relax on a sunny day with the perfect book, adding a hanging swing to your Under Deck System. This is the perfect way to get in touch with the outdoors and enjoy your favorite form of literature. Socializing outdoors with friends and family is better on comfortable seating. Place weather resistant furniture on your under deck to retain their beauty and prevent the colors from fading in the sunlight. There’s nothing better than a hot soak in a tub or spa to ease away the day’s stressors. After a long day, you can soak in a hot tub from the privacy of your under deck. 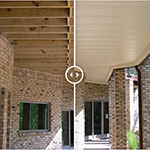 Under Deck Systems by RainAway uses a special ventilation system and patented support brackets to enhance airflow above and below the system that will speed up drying time after summer showers. 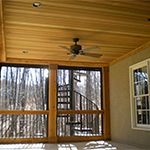 Enhance the beauty of your home with an under deck. Our under deck system can transform the ugly, unused space under your deck into an outdoor living area that’s clean and enjoyable, without costly reconstruction. 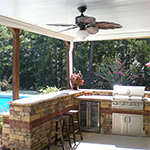 For more information about an Under Deck System in Georgia, call RainAway today at (770) 928-7246.